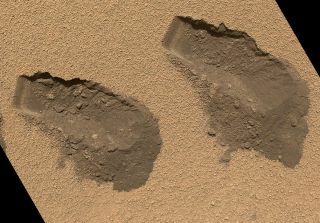 This is a view of the third (left) and fourth (right) trenches made by the 1.6-inch-wide (4-centimeter-wide) scoop on NASA's Mars rover Curiosity in October 2012. The image was acquired by the Mars Hand Lens Imager (MAHLI) on Sol 84 (Oct. 31, 2012). This story was updated at 1:09 p.m. ET. NASA's Mars rover Curiosity has discovered complex chemistry on the Red Planet, as well as hints of long-sought organic compounds that could aid primitive life, scientists announced today (Dec. 3). The Curiosity rover found evidence of chlorine, sulfur and water in Mars dirt studied by its onboard laboratory, as well as organic compounds (chemicals containing carbon) inside its Sample Analysis at Mars instrument. However, the science team can't yet be sure whether these compounds truly come from Mars, or arise from contamination transported to the Red Planet onboard Curiosity. "SAM has no definitive detection to report of organic compounds," Paul Mahaffy, SAM principal investigator at NASA's Goddard Space Flight Center in Greenbelt, Md., said during a press conference at the annual meeting of the American Geophysical Union in San Francisco. The announcement came after recent rumors — which NASA attempted to dampen last week — that Curiosity had made a huge discovery on Mars. NASA's Curiosity Mars rover documented itself in the context of its work site, an area called "Rocknest Wind Drift," on the 84th Martian day, or sol, of its mission (Oct. 31, 2012). Image released Dec. 3, 2012. The observation by Curiosity involved perchlorate, a reactive compound of oxygen and chlorine that had previously been found in the Martian arctic by NASA's Phoenix lander. Curiosity's SAM instrument uses a tiny oven to cook Mars dirt samples, then study the gases they give off to determine their chemical makeup. Martian soil samples are placed in the device by a scoop on Curiosity's robotic arm. When Curiosity cooked the perchlorate in its SAM oven, it created chlorinated methane compounds, one-carbon organic material. "The chlorine is of Martian orgin, but it's possible the carbon may be of Earth origin, carried by Curiosity and detected by SAM's high sensitivity design," NASA officials wrote in a statement. The new findings by Curiosity came during the rover's study of a patch of windblown Martian dust and sand called "Rocknest." It is a flat stretch of Mars terrain that is still miles away from Curiosity's first destination, rock outcrop called Glenelg at the base of the 3-mile (5 kilometers) Mount Sharp that rises from the center of the rover's landing site — the vast Gale Crater. While scientists puzzle out the validity of Curiosity's SAM signals, the rover's other instruments have made curious discoveries, as well, mission scientists said. Curiosity's arm-mounted tools have confirmed that the Martian soil at the Rocknest site is similar in chemical composition and appearance to the dirt seen by NASA's three other rovers: the small Pathfinder, and golf cart-size Spirt and Opportunity rovers. The Mars Hand Lens Imager (MAHLI) on NASA's Mars rover Curiosity acquired close-up views of sands in the "Rocknest" wind drift to document the nature of the material that the rover scooped, sieved and delivered to the Chemistry and Mineralogy Experiment (CheMin) and the Sample Analysis at Mars (SAM) in October and November 2012. Image released Dec. 3, 2012. Photos from the rover's Mars hand Lens Imager, or MAHLI, revealed that the sand drifts at Rocknest have a crusty surface that hides even darker, finer sand below. "Active drifts on Mars look darker on the surface," MAHLI principal investigator Ken Edgett of Malin Space Science Systems in San Diego said in a statement. "This is an older drift that has had time to be inactive, letting the crust form and dust accumulate on it." Meanwhile, Curiosity's Chemical and Mineralogy detector, called CheMin, found that the terrain around Rocknest is a mix of volcanic and glassy, non-crystalline materials. While the rover found more evidence of water than expected, some water molecules bound to bits of sand were anticipated, scientists said. The car-size Mars rover Curiosity landed on the Red Planet in early August. The $2.5 billion robot is the largest rover ever sent to another planet and is expected to spend at least two years exploring Gale Crater to determine if the region could have ever supported microbial life. This story will be updated with more details from today's announcement shortly.